This song is “Cara Mia Addio” – the so-called “Turret Opera” from the end of the video game Portal 2. It’s a beautiful song, and for the floppy drives’ first performance together I thought it would be fitting to have these machines play a song that was, at least canonically, played by machines. This MIDI file is included as one of the sample songs in the Moppy repository. You can download it here. 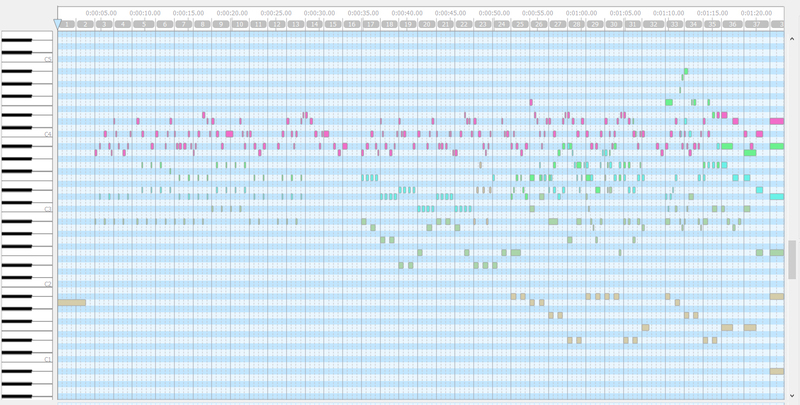 These are the 1:1 channel mappings from the MIDI file. The track naming is from the MIDI file as well, and you’ll see that the ‘Solo’ notes played by drives #2 and #6 are identical. Channels 9 – 16, on this file, contain no notes. While it’s possible to pool drives in the Moppy software or to re-arrange the channels in the MIDI file itself, I quite liked the way this sounded as-is. In the video, the drives are arranged in two rows of 4, with drive #1 on the top right. The numbering continues sequentially from right to left, top to bottom (i.e. drive #5 is directly underneath drive #1). The drives are very quiet, so I recorded the video and audio separately and synced them in the editor. The video was filmed with my DSLR, while the audio was recorded with the onboard microphones of a Tascam DR-40. For the audio recording, I pushed drives #1 and #5 away and set the stereo microphones directly in the center of the remaining 6 drives about ~1″ away. Even with gain maxed out, I still had to boost the audio levels in post. Since this is my first video with all 8 drives working (yay! ), I wanted the recording to reflect that. The audio recording is as-is and has not been edited except for a levels boost. If I do end up recording my own music in the future, I’ll record each drive separately and mix them in editing for a cleaner master. But for what is essentially a proof of concept video, I’m content with the natural mix. I didn’t take the drive covers off for this recording, so it’s not quite as visually interesting as the single-drive one. But it sounds more interesting for sure! With everything working, the next steps would usually be to either find some MIDI files to play or to write your own. But I have a few more ideas on how to improve this that I want to tackle before going crazy with the music making. Stay tuned!